I had a factory threaded barrel and PX4 hammer CPII plated. I finally got around to swapping the hammer in...being a frame safety, its quite tedious if you don't have three hands. I also finally got a stamp back on my pair of Liberty Centurions, so its nice to not have a HUGE 45acp can on the gun. While I had it apart, I did a mild action tune on it...polishing the hammer spring, trigger bar and hammer strut. I'd already stoned and polished the feed strip on the slide so it has a very nice feel. I also stoned the sear hook on the hammer and did a nice polish on the surfaces. Nice trigger overall but not really worked over too much. This one doesn't get shot much as I have an e-nickel frame safety 92 that's my go-to for range time. Looking good. Where are the grips from? KSD in Turkey. Took a bit of fitting to get them to work, notably around the right-side safety to clear it without putting pressure on the wood. It is a wonderful looking pistol. You have shown this pistol before,(I never get tired of looking at it by the way), but I never noticed it had a M9 frame. Did you have to machine out the holes for the thumb safety? That is a nice franken gun with, I am sure, quite of bit of time in it. Cool project. 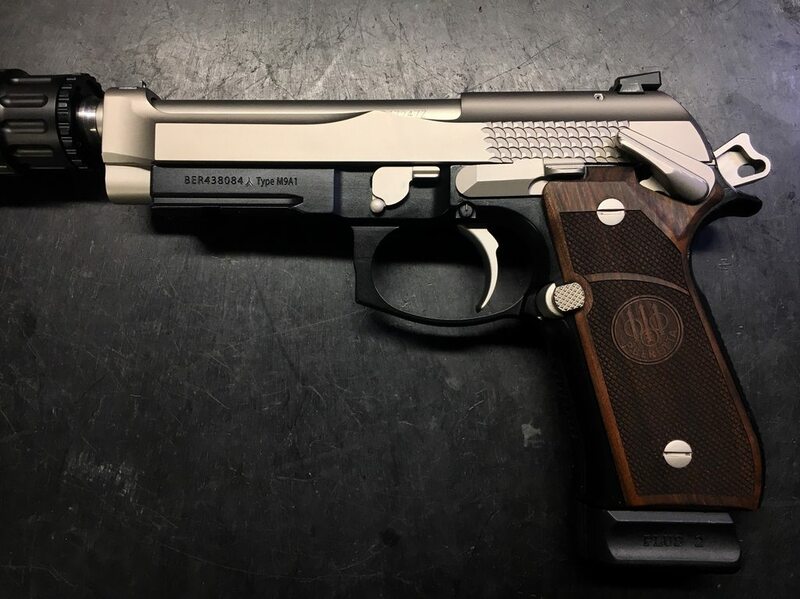 One of the nicest Berettas I have seen yet. How much work is the frame safety conversion? 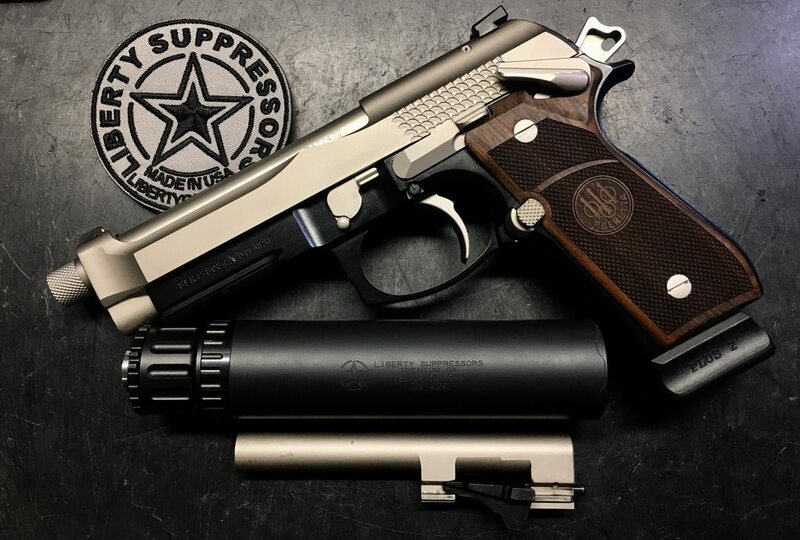 How do you like the Liberty suppressor? “There is love in me the likes of which you’ve never seen. There is rage in me the likes of which should never escape." If that was a factory gun I couldn't get my greedy little mitts on one fast enough. Great job. Beautiful! I wish Beretta made the frame mounted safety guns more affordable. 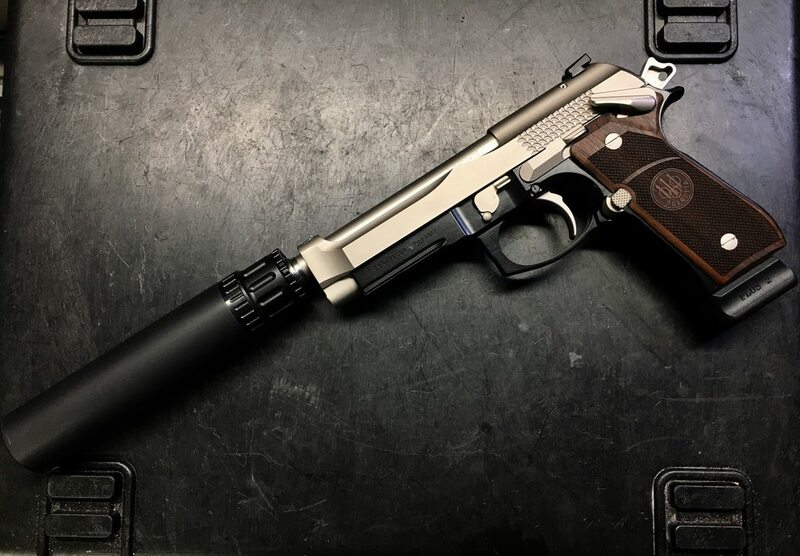 oh wow, that is one GORGEOUS pistol!!! The quirks and latent issues of the 92 series are well-known and too often repeated. But damn do they make for a timeless beaut of a pistol. Ok...I have to ask, how did you get that slide? You didn't actually cannibalize a Billenium did you? I’ve seen Billenium slides but only with the billboard roll marks. Cancer fighter (Non-Hodgkins Lymphoma) since 2009, now fighting Diffuse Large B-Cell Lymphoma. Nah, he got the slide from beretta a few years back, put it on the m9 and went from there. Well I figured his was refinished since the Billenium slide markings were only light laser etched, it wouldn't be hard to remove them completely. IIRC he said it was on their website in the parts area.